Ellipz Study Lamp: Possibly the ONLY Eye Care Lamp for Kids + GIVEAWAY! Singapore's myopia rates are one of the highest in the world. But you already know that, don't you? In fact, a 2012 study on child myopia by NUS' School of Public Health shows that the myopia rates are 29% in Singapore among six-year-old children in Singapore. I shudder to think what that figure is right now. Considering the fact that kids nowadays spend most of their time poring over their books, it should not come as a surprise actually. But surprisingly, staring at books is not one of the main culprits of having a high myopic rate. Using inferior lighting is also detrimental to our kids' eyes in the long run. Which is why it is so important to choose the right light for them to read and do their homework in good lighting conditions. And that is where the Ellipz technology comes in. Ellipz Lighting is a Dutch company founded in Holland when two members of the Philips (yes, that huge Dutch electronics company) family teamed up with inventor John Rooymans with one mission in mind - to create LED lights that emit light that perfectly matches the sensitivity of the human eye for indoor and night-time vision. White light is created by mixing the proper amount of light from red, green and blue LEDs. Without getting into complicated physics, there is an inverse relationship between the wavelength of light rays and the amount of energy they contain. Light rays with longer wavelengths contain less energy, and those with short wavelengths have more energy. So rays on the red end of the visible light spectrum have longer wavelengths and hence, less energy. 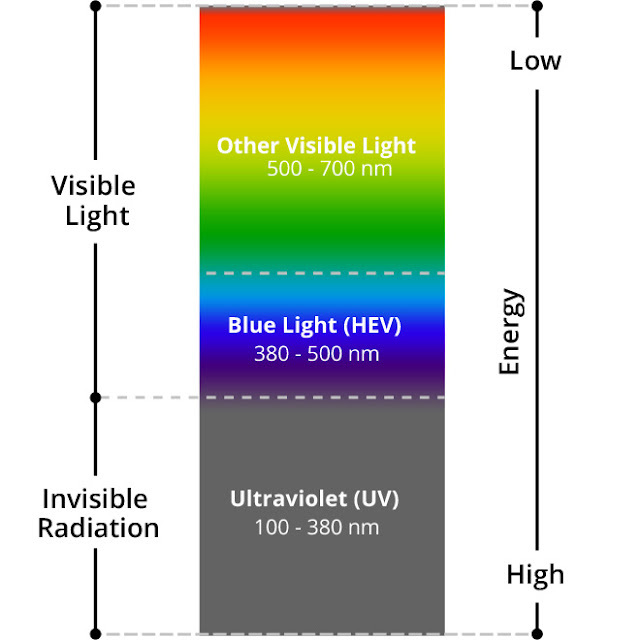 Rays on the blue end of the spectrum have shorter wavelengths and more energy. Because they are shorter, these "Blue" wavelengths flicker more easily than longer, weaker wavelengths. This kind of flickering creates a glare that can reduce visual contrast and affect sharpness and clarity which may be one of the reasons for eye strain, headaches, physical and mental fatigue caused by many hours sitting in front of a computer screen, under a LED lamp or other electronic device, which are one of the many sources of blue light. The biggest problem is our eyes are not very good at blocking blue light - which explains why our eyes feel tired after prolonged usage of an electronic device or doing work under a table lamp. Yes, most of the current table study lamps in the market consist of LED lighting that emit blue light (because it is cheaper to manufacture). Hence, the need to include a 'polarizing filter'. And even though the filter is claimed to reduce the glare, it does NOT cut out the harmful blue light. And prolonged exposure to blue light may cause retinal damage and contribute to age-related macular degeneration, which can lead to loss of vision. Enter the Eye Care Lamp from Ellipz Lighting. For starters, Ellipz Lighting uses CYAN phosphors base LED instead of blue base LED. And this is a HUGE difference because it ensures that blue light is kept to a minimum with its unique LED technology and its blue light content is 40% lesser compare to other LED table lamps. So there is NO blue light hazard! And no, there isn't any need for the Ellipz lamp to come with a polarizing filter simply because it is designed to be Anti-Glare and Flicker-Free. Features-wise, the lamp allows control of up to 5 levels of brightness with just a touch of one's fingertip. It even comes with a LCD display for date and time too - perfect for the instances when the boys are doing their mock exam papers during revision time so that they can keep track of their times! LOL. The study lamp also allows for flexible angle adjustments, thanks to its 3 pivoting points. In fact, it can even be used as an up-light as the light source can be rotated to face upwards. I also found it to be extremely useful to use the lamp for photographing products that I am reviewing! The great thing about the Ellipz Eye Care Lamp is it has one of the highest Color Rendering Index, which translates to enabling one's eyes to see true colours... as can be seen by the photo below. I took the photo in a room with the curtains drawn and only with the lamp switched on. Very impressive! The other thing I love about the study lamp is how absolutely little space it takes up on the table. And when not in use, I simply push the lamp's arm downwards. No unsightly or space-wasting headaches. Oh, and did I mention that the lamp also comes with a USB Port as an extra power source to charge your devices at the same time? With kids of today spending so many hours of study under artificial lighting - and that's excluding the time spent in front of electronic devices! - the risk of prolonged exposure to harmful light, and blue light in particular, is very real. The Ellipz Eye Care Lamp contains NO blue light hazard and is specially designed for kids to use. It allows them to see clearer, better and in the right colours with quality natural white light and in the process, protect their eyes by generating less stress and strain which greatly slow the progression of myopia. And that is all that matters, if you ask me. Thanks for Ellipz Lighting, I have THREE sets of Ellipz Eye Care Lamp to give away! You have each won one Ellipz Eye Care Lamp! Please email me at kelvin@cheekiemonkie.net for details of your prize collection. Thanks! Tell me one feature of the Ellipz Eye Care Lamp that you love. Giveaway ends on 10 June 2016, 2359 hours. The Ellipz Eye Care Lamp is currently retailing at a promotional price of S$179.10 (U.P. S$199) at all local Popular Bookstores. For enquiries, contact Beste (Singapore) Pte Ltd (Exclusive Distributor) at +65-6552 2422 or email info@beste.com.sg. It contains no blue light hazard which is an excellent feature for kids. No blue light hazard. Neat and compact design. It has flexible angle adjustments so we can adjust to suit everyone in the house. My favourite feature of all has got to be the date and time LCD display! This is really convenient and it's one less item (the clock) to buy and clutter up the children's studying table. Blake's entering primary school soon and I doing all I can create a nice space for him to get used to and then hopefully, enjoy studying at. I like the compact design of the study lamp which allows us to close the arm of the lamp when not in use, so that the kids will not accidentally hit it. Anti-glare and flicker-free! Would be great if it indeed decreases risk of myopia. The number of kids with myopia here in Singapore is just too scary. I the Netherlands, though (we lived there for a year), it's quite rare. You don't see kids there wearing specs. Nor adults, for that matter. I wonder why they thought of this in a country where myopia isn't even prevalent. There is no blue light hazard. Hope to win one. Anti-Glare and Flicker-Free. There's no blue light. Hope to win one for the kids. I like it's flexible angle adjustments. We love the no blue light hazard!!! Need to prevent myopia as genes has high myopia. Ellipz Lighting uses CYAN phosphors base LED instead of blue base LED - I like that. I like that it contains no blue light hazard. Good for my girl's eyes which are increasing in degree. The Ellipz Eye Care Lamp contains no blue light to help kids see clearer and better with protection! My favourite feature is less blue light exposure to protect the eyes! It's is something that didn't cm to my mind prior to reading this post. I love the Ellipz Eye Care Lamp because it contains NO blue light hazard and is specially designed for kids to use. It allows them to see clearer, better and in the right colours with quality natural white light and in the process, protect their eyes by generating less stress and strain which greatly slow the progression of myopia. All-purpose study lamp! Anti-Glare, Flicker-Free, no blue light & adds as USB charger for devices! Definitely a must have for the kids! One feature I like : The Ellipz Eye Care Lamp contains NO blue light hazard and is specially designed for kids to use. It allows them to see clearer, better and in the right colours with quality natural white light and in the process, protect their eyes by generating less stress and strain which greatly slow the progression of myopia. I like the Anti-Glare and Flicker-Free feature of the Ellipz Eye care lamp. This is going to be useful for my boy who's degree is increasing every 6 months and hopefully with this, it can generate less stress on his eye and slow down the progression of myopia. The feature I like is Ellipz Eye Care Lamp contains NO blue light hazard and is specially designed for kids to use. It allows them to see clearer, better and in the right colours with quality natural white light and in the process, protect their eyes by generating less stress and strain which greatly slow the progression of myopia. My favourite feature : Ellipz Eye Care Lamp contains NO blue light hazard and is specially designed for kids to use. It allows them to see clearer, better and in the right colours with quality natural white light and in the process, protect their eyes by generating less stress and strain which greatly slow the progression of myopia. I love the many useful features of the Ellipz Eye Care Lamp. But the one feature that I really appreciate is its NON Blue Light existence. Both my children have myopia and we have no control over their shortsightedness acceleration at all. We had to replace their glasses as often as 6 months! After several visits to the National Eye Centre, we have their eyes under control. But it is still extremely necessary and important to use premium lighting such as Ellipz Eye Care Lamp to protect our children's eyes. One of the feature is flexible angle adjustment. Thank you Cheekiemonkies for sharing this review about table study lamp, it is very useful and informative to me. I learnt something new and important. And thank you Ellipz Lighting and Cheekiemonkies for this giveaway.I love Ellipz Study Lamp simply because it is an EYE CARE LAMP and together let's help to slow down or prevent myopia in our little ones. No blue light hazard is the technology for my new table study lamp.